Thank you for 33 fulfilling years... 1983 - 2016. It's time for us to retire and smell the essential oils. We wish you the best in all your spa ventures. In 1983, Judy Singer and Patty Monteson saw there was an unmet need for a company to offer spa consulting services to developers, investors, owners, operators and asset managers. They decided to form such a company and established Health Fitness Dynamics, Inc. as a spa consulting company specializing in planning, marketing and management advisory services for fine hotels, resorts and mixed-use developments. After 25 years of following and sharing our passion and creating successful spa ventures all over the world, we decided to put "spa" in our name and use the name that our clients typically use...HFD Spa. HFD Spa has worked on almost every continent and has been the spa consulting firm to over USD$700 million of completed spa development. Their clients have benefited from their seasoned business know-how, coupled with the creativity and intuition that come from years of experience. In 2009, HFD Spa re-focused its energies from developing and opening new spas to management advisory services for existing spas. HFD has always helped its turn-key clients from development to opening to maximizing their operational efficiency, but now HFD Spa is offering management advisory services to all existing spas. 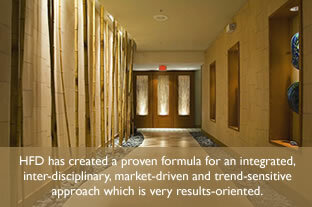 HFD Spa is committed to using its experience, expertise and resources to help spas be more marketable and profitable.